This interesting surname is a diminutive of the personal name "Adam", which was borne, according to Genesis, by the first man. It is of uncertain etymology; it is often said to be from the Hebrew "adama" meaning earth. The personal name appears as "Adecok" (1246) in the Assize Court Rolls of Lancashire, and the surname dates back to the early 13th Century (see below). Early recordings include Robert Adekok (1275) in the Subsidy Rolls of Worcestershire, and John Atkoc (1327) in the Subsidy Rolls of Staffordshire. 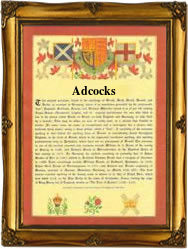 Variations in the spelling of the surname include Adcocks, Atcock, and Hadcock. London Church Records list the marriage of William Adcocke to Joane Attkinsone on December 5th 1591, at St. Olave's, Hart Street, and the marriage of Richard Adcock to Katheren Frie, on December 20th 1593, at St. Giles', Cripplegate. A Coat of Arms granted to an Adcock family is blue, on a silver saltire, nine pellets. The Crest is a silver fox's head issuing. The first recorded spelling of the family name is shown to be that of Richard Hadecoc, which was dated 1226, in the "Register of the Freemen of Leicester", during the reign of King Henry 111, known as "The Frenchman", 1216 - 1272. Surnames became necessary when governments introduced personal taxation. In England this was known as Poll Tax. Throughout the centuries, surnames in every country have continued to "develop" often leading to astonishing variants of the original spelling.